We went to Broadway the other night to see a straight play and the theater was full. When we walked into the theater, a half hour before show time, there was a man on stage sitting in an armchair with his back to us. He didn’t move until the lights went down. 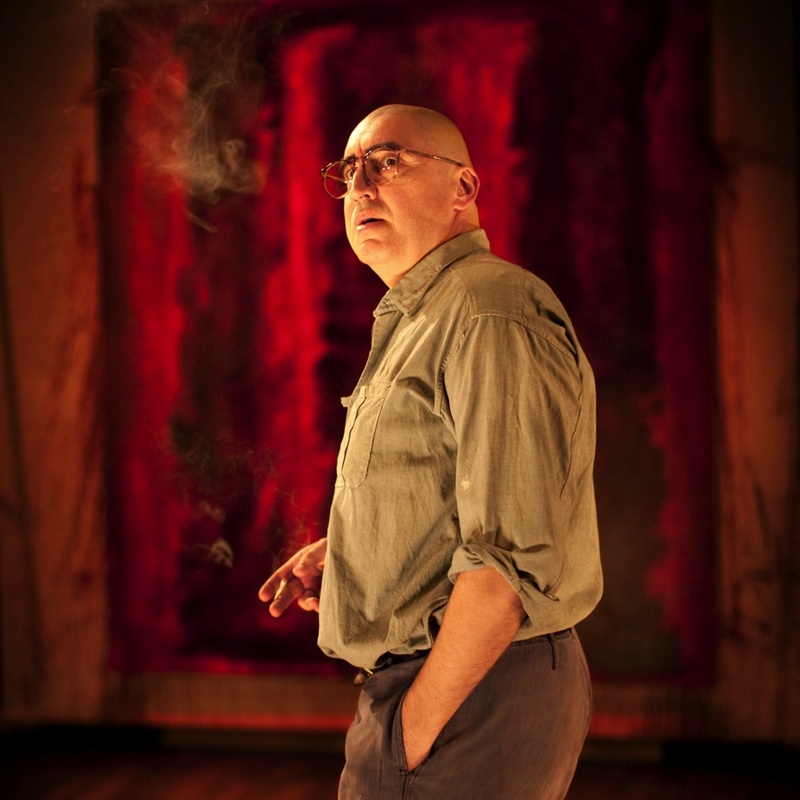 Turns out he was the brooding, contemplative Mark Rothko (played by Alfred Molina), staring at one of his large red and black canvasses with several others around him. The plot, there really isn’t one, let us say the exploration of art, is brought forward by a continuous conversation that Rothko has with his young assistant, Ken (Eddie Redmayne). Actually it is more of a monologue than a conversation. Ken is the foil and you can see him trying to hold in his personal opinions until, in one of the most dramatic moments I have ever seen, Ken pours out an impassioned commentary from the young artist’s point of view. 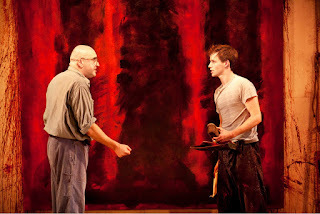 The playwright (John Logan) uses Rothko’s view of the art world to address the question of what is art, and as Eddie Redmayne, accepting his Tony award said, “how much the arts matter”. I am always amazed at how few artists today understand or even care about what has been done before but I am impressed by those artists who are interested in the work of their predecessors (e.g. Jeff Koons who collects Old Masters; Joel-Peter Witkin who searches out antique frames to use with his photographs.) . In this play Rothko insists that in order to understand art, and more particularly his art, one needs to know and understand all that went before, and not just the art history but music and philosophy as well. Rothko wants his work to have great meaning and significance. Ken points out to him that he is selling out by undertaking the commission for the Four Seasons Restaurant of a series of painting to go around the main dining room. Rothko’s defense is that he wants to put the “rich bastards” dining there off their food. Ultimately, after visiting the restaurant, he calls Philip Johnson, the architect responsible for the interior, and says that he won’t turn over the paintings and is returning his $35,000 advance. In the play Rothko says “There’s only one thing I fear in life, my friend, one day the black will swallow the red.” In fact, more and more black did appear in his paintings over the years, reflecting the dark side of his personality. He committed suicide in 1970 before his dream, and arguably his greatest work, the de Menil chapel was completed. 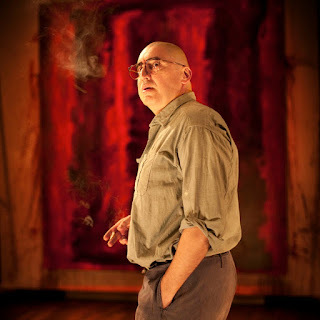 If you have ever spent time looking at Rothko’s work you know that his paintings come alive with less light and even with the reproductions on the stage the point is well illustrated when Ken suddenly turns up the lights to illustrate the point. When you are in the Rothko chapel in Houston you really understand. As we left the theater I heard a woman talking about an artist she knew who had worked as Rothko’s assistant for two and a half years. He had told her that they were not allowed to talk in the studio. Only during lunch could they break the silence. This revelation did not affect my enjoyment of the play in the slightest as the dialog was merely a vehicle for Logan’s insight into this artist and the creating of art. Since the actors have other commitments “Red” is here for only a limited engagement. Sadly, after winning 6 Tonys, it will close at the end of the week. If you want to engage your mind and get into that of the artist I urge you to book a seat. I understand that there are still some left.